29th June 2018, New Delhi: It has been 1 year since the ‘One Nation One tax’, better known as Goods and Services Tax was introduced in India. It was the biggest change in the Indian taxation system which had to battle things like crashing of the GST portal, frequent tax slab changes, businesses indulging in profiteering, lack of awareness in traders and much more. 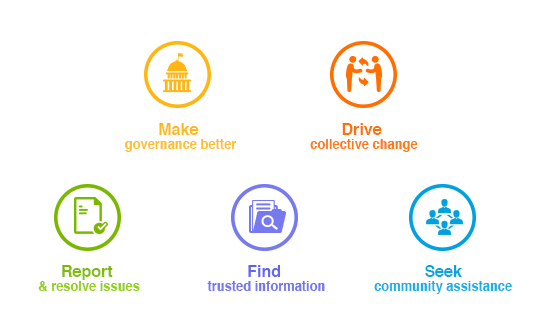 LocalCircles conducted a citizen pulse check to ascertain its impact on the lives of people in the last 1 year. The GST consumer survey consisted of 4 polls which got more than 32,000 votes from across 215 districts in India. 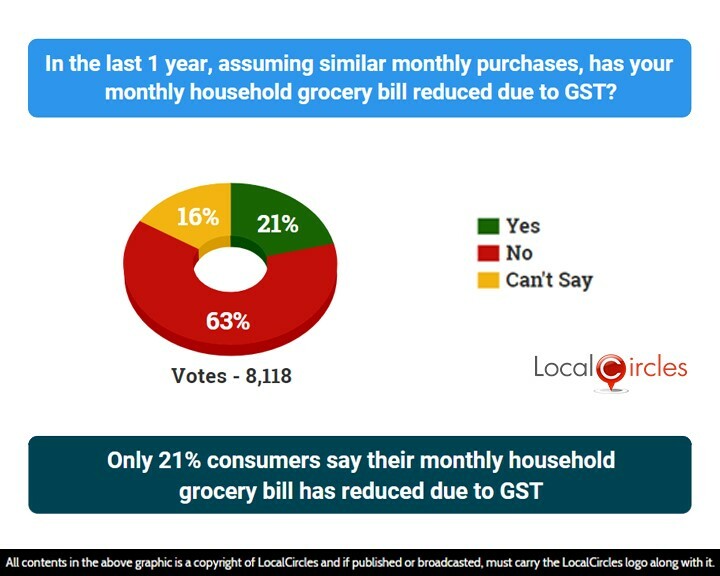 The first poll asked citizens assuming similar purchases, has their monthly household grocery bill reduced due to GST in the last 1 year. Only 21% agreed with it while 63% did not agree with it. 16% were unsure. In November 2017, the GST rate for restaurants was reduced from 18% to 5%. Most of the restaurants, however, did not reduce their prices and in turn, increased their basic costs to keep the amount the same. This led to the benefits of the GST rate reduction not flowing on to the customers. The second question asked if their costs of eating out at a restaurant reduced for them post GST. 28% said yes while 57% said no. 15% were unsure. In the next poll, only 15% consumers felt that businesses were passing the benefits of Input Tax Credit under GST to them. 61% felt it was not happening while 24% were not sure about it. Businesses found it tough to adapt to GST early on due to confusing rules like needing a GST registration in all the states they operate in and filing of 3 returns every month, etc. To increase profits, according to consumers, many businesses increased the base price of the products where GST rate had reduced thereby keeping MRP the same. These complaints are now being shared directly by the consumers with National Anti-Profiteering Authority via the Anti-Profiteering circle on LocalCircles. 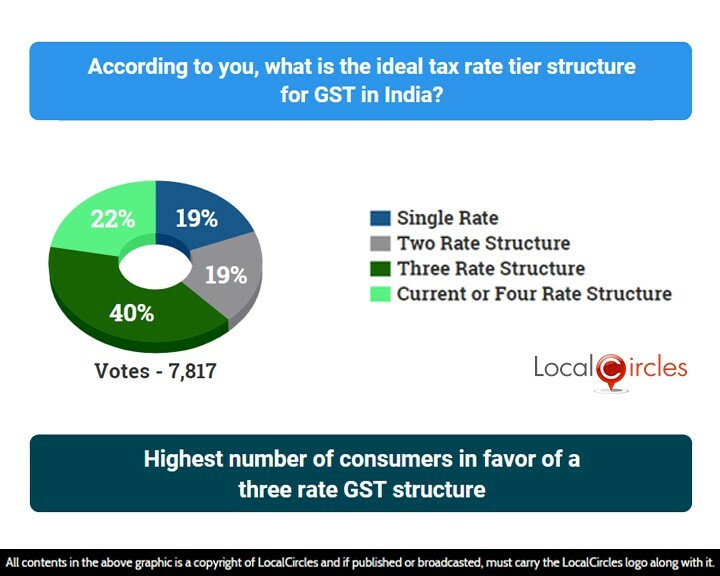 When asked what should be the ideal tax rate tier structure for GST in India, 19% said it should be a single rate and 19% said it should be a two-rate structure. 40% said it should be a three-rate structure while 22% said it should be either the current or four rate structure. 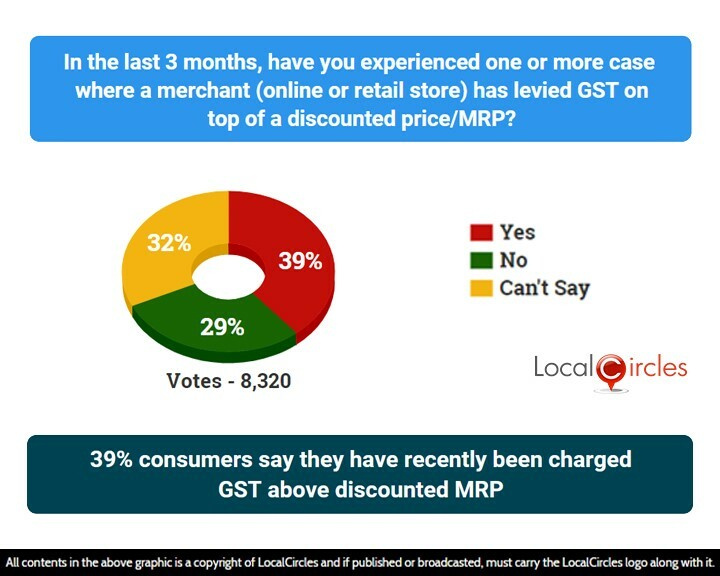 39% citizens also said that they have been charged GST on discounted price once or more while shopping online or in retail stores in the last 3 months. 29% said it had not happened to them while 32% were not sure. Many consumers had earlier reported that sellers were fooling them by charging GST on top of a discounted price and this was against the MRP rule. When GST was introduced, many sellers knowingly or unknowingly charged a GST over and above the MRP of the product. The government swung into action on consumer reports and such instances went down considerably. 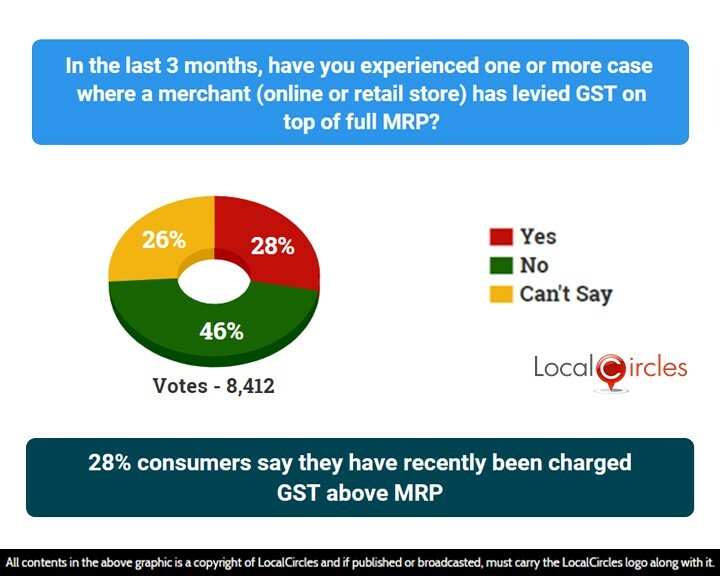 The following question asked if, in the last 3 months, they have experienced one or more cases where a merchant (online or retail store) has levied GST on top of full MRP. 28% answered in a yes while 46% answered in a no. 26% said they were not sure about it. The last question asked how the cost of services (mobile services, movie tickets, etc.) 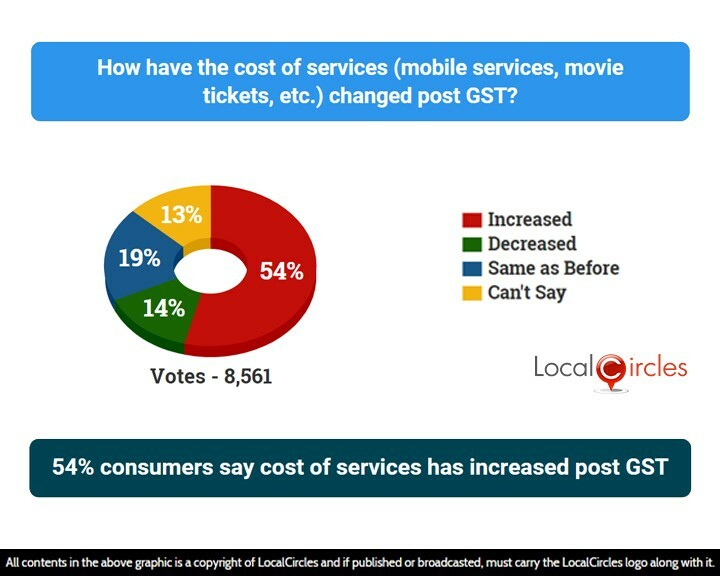 has +changed post GST. 54% said it had increased, while only 14% said it had decreased. 19% said it is same as before and 13% said they were unsure about it. There has been discontent with the regular shuffling of the GST rate slabs and the majority of the consumers want a 3-slab rate to be put to use. On paper, GST is a critical reform to Make Doing Business Easier, which in course of time can make things easier for businesses and the consumers. As the GST regime enters its second year, consumers are optimistic that more benefits will start flowing towards them in the coming year. LocalCircles will be sharing this report with the GST Council and the senior leadership of Central Board of Indirect Taxes & Customs, so that necessary actions can be taken to address the gaps highlighted. Over 32,000 responses were received from over 15,000 unique parents located in 220 districts of India. Approximately 35% of the respondents were women while 65% were men. 42% of the participants were from Metro/Tier 1 cities, 34% from Tier 2 cities and 24% were from Tier 3 and rural locations.